Wynn sat down with Ethan Schoonover, creator of Solarized to talk about the science and design behind the wildly popular color scheme as well as his love for Arch Linux. Ethan Schoonover is a freelance designer, creator of Solarized. 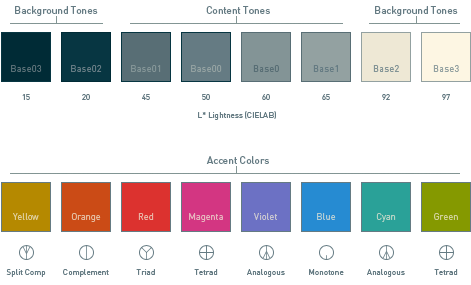 Solarized is a sixteen color palette (eight monotones, eight accent colors) designed for use with terminal and gui applications. Vimscript can be intimidating for noobs. A Lab color space is a color-opponent space with dimension L for lightness and a and b for the color-opponent dimensions, based on nonlinearly compressed CIE XYZ color space coordinates. Achievement unlocked: First guest to mention fovea centralis on the show. “This fellow Wright” is W. David Wright, who experimented with color perception in 1930s. Ethan works out of the LAB space, mapping to other color spaces as tools require. Solarized looks great in a number of fonts as well as syntaxes. Wynn asks if Sass should support LAB. Terminus is Ethan’s favorite fixed with font, but also likes Letter Gothic Mono. Wynn’s litmus test for fixed fonts is the dashrocket alignment. Micah Rich, founder of The League of Movable Type was on Episode 0.7.4. Arch Linux is Ethan’s favorite Linux distro. xmonad is a dynamically tiling X11 window manager that is written and configured in Haskell. The tmux reference on the Arch wiki is most helpful. Check out Episode 0.7.3 for more on tmux. TotalTerminal from the talented Antonin Hildebrand. brew tap makes it easy to tap a new Homebrew formula repository from GitHub, or list existing taps. GIMP is no Photoshop replacement. Haskell is an advanced, purely-functional programming language. XMonad.Prompt.Input is similar to Quicksilver. Karthik’s terminal convinced Wynn to give Solarized a go. Wynn figured out how to do ‘transparent’ colors in the tmux status bar. TaskWarrior is Ethan’s todo manager, which is saying something since he created Kinkless GTD. Drew Neil, creator of Vimcasts, featured on Episode 0.5.6. Dr. Nic Williams, on Episode #50.